Application threats are constantly evolving, and recent high-profile Internet attacks on leading enterprises and government organizations prove that no one is immune. These attacks are multi-layered and constant, and seek not only to deface a website, but to steal valuable data, intellectual property, state secrets, SSL certificates, and other proprietary, highly sensitive information. Many organizations do a decent job of securing their infrastructure components, but are challenged when it comes to securing their web applications, whether they are hosted in house, in a cloud environment, or both. 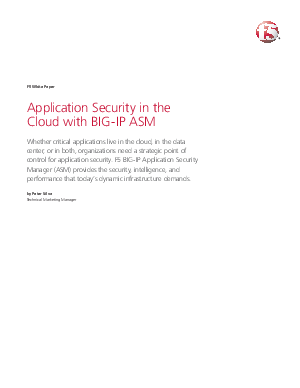 Protecting applications while still making them highly available to valid users is more critical than ever. This paper shows how you can provide the application protection your organization requires to block evolving threats, no matter where the applications are deployed in today's dynamic environments. By implementing a high-performance, ICSA-certified web application firewall (WAF), you can create a strategic point of control within your infrastructure from which your organization can dynamically adapt to changing conditions to securely deliver crucial applications.